This may come as news to a lot of readers, as I don’t think I’ve mentioned it previously, but my mum and sister decided to welcome a new puppy in to their lives, a few weeks before Christmas. 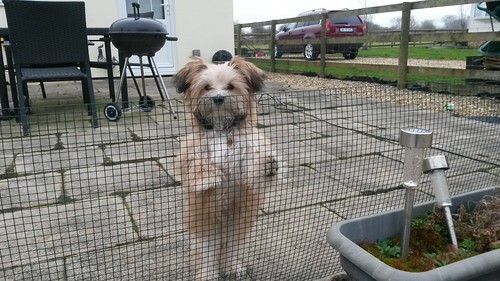 His name is Billy and he’s a ‘Morkie’ (Maltese/Yorkshire Terrier-cross). Mum was asking about a temporary fence to cordon off the shared driveway. Because they live in rented accommodation as well, this needed to be a freestanding option. I took some measurements, browsed around online and eventually came up with the following.